This is an article by Shri Era Sezhian (92), a well known Parliamentarian in the magazine Frontline. AFTER his heavy responsibility and laborious work for over 17 years to bring about a functioning democracy in India as head of the Interim Government and as Prime Minister, Jawaharlal Nehru breathed his last on May 27, 1964. His demise plunged the country into deep and inconsolable melancholy. Within 17 months of that came the bombshell of a news: the death of Prime Minister Lal Bahadur Shastri in Tashkent on January 10, 1966. It benumbed the nation, particularly the Congress party. Its president K. Kamaraj had in 1964 managed to have Lal Bahadur Shastri elected unanimously as Prime Minister. However, he faced a more difficult situation in choosing a Prime Minister in 1966 as Congress leaders such as Morarji Desai, Jagjivan Ram, Y.B. Chavan and Gulzarilal Nanda (caretaker Prime Minister) were in the fray. The Congress Parliamentary Party relied on Kamaraj to find an amicable solution. He was keen to have as Prime Minister someone who would be able to lead the Congress party in the general election of 1967. Ultimately, he decided on Indira Gandhi. He was aware that his friends Morarji Desai and other members of the group called Syndicate would not accept Indira Gandhi at any time. However, Kamaraj proceeded intensely to mobilise support for Indira Gandhi by contacting important leaders and Chief Ministers. At the Congress Parliamentary Party meeting on January 15, 1966, only Indira Gandhi and Morarji Desai remained as contestants. Mediapersons were waiting anxiously to know whether it was a “girl” or a “boy”. At the end of the counting, the announcement was that it was a “girl”. Indira Gandhi was profusely thankful to Kamaraj who was solely responsible for the unforeseen event of her becoming the Prime Minister. In the formation of the Cabinet, Kamaraj insisted that Indira Gandhi retain most of the Ministers of the Shastri government, and she acted accordingly. In her biography Indira Gandhi, Pupul Jayakar noted: “She [Indira] needed Kamaraj’s support and therefore she assumed the role of a pupil, agreeing to every move suggested by him” (page 178, Penguin Books). In June 1966, Indira Gandhi made a drastic devaluation of the Indian rupee, by 35.5 per cent at one stroke. Pupul Jayakar wrote in her biography: “It was shortly before the devaluation of the rupee that she spoke to Kamaraj. He was very upset and angry and felt that the Prime Minister should not have relied on bureaucrats and advisers who had little understanding of the political scene. Speaking to a friend, Kamaraj commented on the great mistake in making Indira Prime Minister: ‘A great man’s daughter, a little man’s great mistake.’” (page 197). In the chessboard of politics, a small error in moving a pawn may result in a great defeat because of the well-placed formidable queen piece on the opposite side. When Indira Gandhi was appointed Minister for Information and Broadcasting in the Shastri Cabinet, she was not a member of either House of Parliament. She got elected to the Rajya Sabha on August 26, 1964. She retained the position when she became Prime Minister in 1966. H.V. Kamath, a Member of Parliament noted for his acumen for constitutional and parliamentary procedures (as revealed in his active participation in the Constituent Assembly on each and every Draft Article taken for consideration), moved a private member’s Bill in the Lok Sabha for the amendment of Articles 75 and 164 of the Constitution. As Prime Minister Indira Gandhi was not an elected member of the Lok Sabha, the Bill attracted the attention of the media and MPs in the labyrinthine political situation of 1966. Initiating the discussion of the Bill on April 15, 1966, Kamath said: “India should set an example in this matter of constitutional and parliamentary manners. The Constitution should stipulate categorically that the Prime Minister of the Union should be an elected member of the Lok Sabha…. Of the 16 Ministers of the present Cabinet, seven are from Rajya Sabha and nine from Lok Sabha. No other parliamentary democracy in the world shows such an example with regard to its own Cabinet. I am sorry to point out that one member who had been defeated in the last election had been appointed to the present Cabinet…. In conclusion, Kamath remarked that he was not against the Rajya Sabha. He had respect for that House, and his only demand was that the Prime Minister should be an elected member of the Lok Sabha. As more members wanted to participate in the discussion, the House adopted a motion extending its time. Yashpal Singh (Independent) and Viswanath Pandey (Congress) moved amendments to the Bill seeking circulation of the Bill for public opinion. Kamath welcomed the idea. Harish Chandra Mathur, a senior Congress leader in the Constituent Assembly and also a member of the Rajya Sabha (1952-56) and the second and third Lok Sabhas, spoke: “As far as the basic principle of the Bill is concerned, I think there can be no two opinions and it will have my full support…. So far as the Prime Minister is considered, it is the first time that we are faced with a difficult situation…. I feel that the only correct thing could have been for the Prime Minister, even before taking the oath before the President, to have resigned from that House. Without being a member of any House, she could be the Prime Minister for six months and then the election should have followed…. I have been advocating all the time that it is time to do away with the emergency…. But it is very significant and important that the government and the Prime Minister make a policy decision that they subscribe to this particular view. Healthy convention or constitutional amendment? The Bill evoked 32 members of the House to participate in its consideration—19 from the Congress party and 13 from the opposition. All but one of the Congress members participating in the discussion supported the Bill in principle but wanted to develop it by convention. In his reply, Kamath said: “I thank the warm support not merely in the House, but in the press and among the people as well. It has been said by several honourable members that we may not amend the Constitution for this purpose. Why not a convention, a healthy tradition as it has grown up in other countries to support the grand edifice of parliamentary democracy…. I wish, and pray to God also, that such a tradition grows in our country. I would like to remind you all that of the manifold ways in which healthy traditions have not grown in this country, but also traditions are set at naught in various ways. I would only point out one or two instances…. The House was adjourned on that day (April 29, 1966). At the next session of the private members’ business on May 13, 1966, the voting was to be taken as per the Rules of Procedure in respect of a Constitution Amendment Bill. As the government opposed the amendment Bill, the Bill was negatived when the division was taken. Indira Gandhi successfully contested the 1967 election to be a member of the Lok Sabha and attended the Lok Sabha on March 7, 1967, as the Leader of the House. The Leader of the House is an important functionary directly and immediately responsible for issues in that House to which the Cabinet is solely accountable. When in 1991, P.V. Narasimha Rao was elected Prime Minister, he was not a member of either House of Parliament; however, within the time prescribed, he won a byelection from the Nandyal Lok Sabha constituency by an enormous lead of over five lakh votes—a Guinness record. When major parties such as the Congress, the Janata Party, the Janata Dal and the Bharatiya Janata Party formed governments, the Prime Minister was invariably a member of the Lok Sabha. After the 2004 election, the Congress was to form the government with the support of 14 of its electoral allies and the outside support of the Left parties. At the time, Congress president Sonia Gandhi had been elected to the Lok Sabha. Though she was called by the President to form the government, she chose Manmohan Singh as Prime Minister. The question is: What happened to the solemn commitment made by the Indira Gandhi government during the Lok Sabha debate of the H.V. Kamath Bill in 1966? Was the appointment of Manmohan Singh as Prime Minister in 2004 not a departure from the solemn declaration made in 1966 by the Congress government and the Congress party on the acceptance of the principle that the Prime Minister should be an elected member of the Lok Sabha—a principle to be implemented by “convention having more force than the written Constitution”? The government stated in 1966 that “there may be occasions—that too for a limited period—a Prime Minister has to be from the other House”. 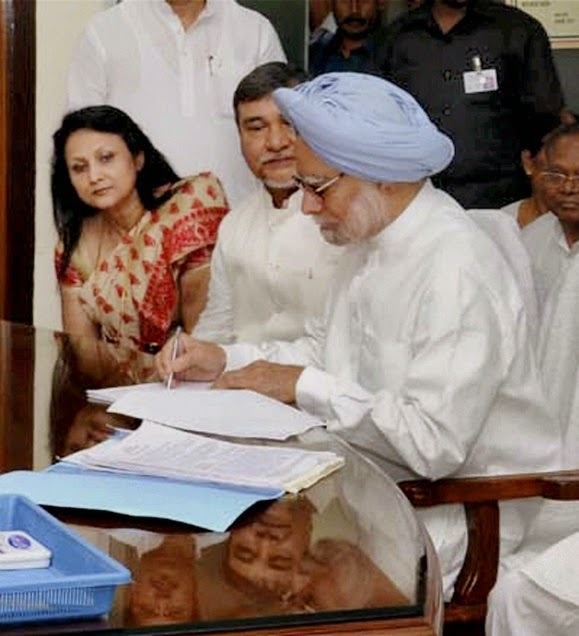 Prime Minister Manmohan Singh has continued in the post of Prime Minister for over nine years. Is it a “short period” as visualised in 1966? In the Lok Sabha debate in 1966 Congress member Harish Chandra Mathur referred to the decision of Prime Minister Jawaharlal Nehru that “all the Cabinet Ministers from the House [Rajya Sabha], if they were to continue in the Cabinet after the elections, must contest the elections and come to Lok Sabha”. Is there an exemption to the post of Prime Minister in the case of Manmohan Singh? H.V. Kamath pointed out in the Lok Sabha that one member who had been defeated in the prior election was appointed to the Cabinet of Indira Gandhi—incidentally at that time it attracted wide criticism and evoked critical comments in the media. Has this point any relevance now in the case of Manmohan Singh who, despite being defeated in the 1999 general election from the South Delhi parliamentary constituency, continues to be Prime Minister? The daily assessment can be done only by the Lok Sabha in India; hence the Prime Minister should necessarily be an elected Member of the Lok Sabha. In his meritorious treatise Cabinet Government, Ivor Jennings stated: “The government owes a responsibility to the House of Commons alone. A vote in that House can compel the government either to resign or to advise dissolution of the House. The Prime Minister is not merely chairman of the Cabinet; he is, also, responsible for the party organisation. That organisation matters in the House of Commons and does not matter in the House of Lords. Even when the government has the majority in the House of Lords, the effective decisions are taken in the lower House. It is essential, in practice, that the Prime Minister should have his finger on the pulse of Parliament; that is in the House of Commons” (page 24). More categorical was the assertion of Walter Bagehot in his The British Constitution: “A Prime Minister must show what he is. He must meet the House of Commons in debate; he must be able to guide the Assembly in the management of its business, to gain its ear in every emergency, to rule it in its hours of excitement. He is conspicuously submitted to searching test, and if he fails, he must resign” (page 58). In his nine years of adorning the venerable post of Prime Minister, Manmohan Singh has failed miserably in all his duties which require no searching test; the only option before him is resignation.